The Temptation of St. Anthony is one wing from the Isenheim Altarpiece by Matthias Grünewald. The panel depicts Saint Anthony being tormented by monstrous demons sent by Satan. 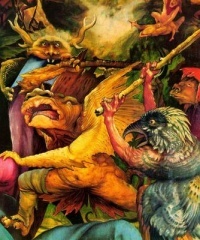 Trampled to the ground, beaten with sticks, his hair pulled, torn by claws and bitten, Saint Anthony appeals to God for help who sends angels to combat these evil demons. In the lower left corner, the humanoid being with webbed feet and a distended belly seems to personify the disease caused by ergot poisoning, resulting in swelling and ulcerous growths. Unless indicated otherwise, the text in this article is either based on Wikipedia article "The Temptation of St. Anthony (Isenheim Altarpiece)" or another language Wikipedia page thereof used under the terms of the GNU Free Documentation License; or on original research by Jahsonic and friends. See Art and Popular Culture's copyright notice. This page was last modified 20:06, 15 October 2013.